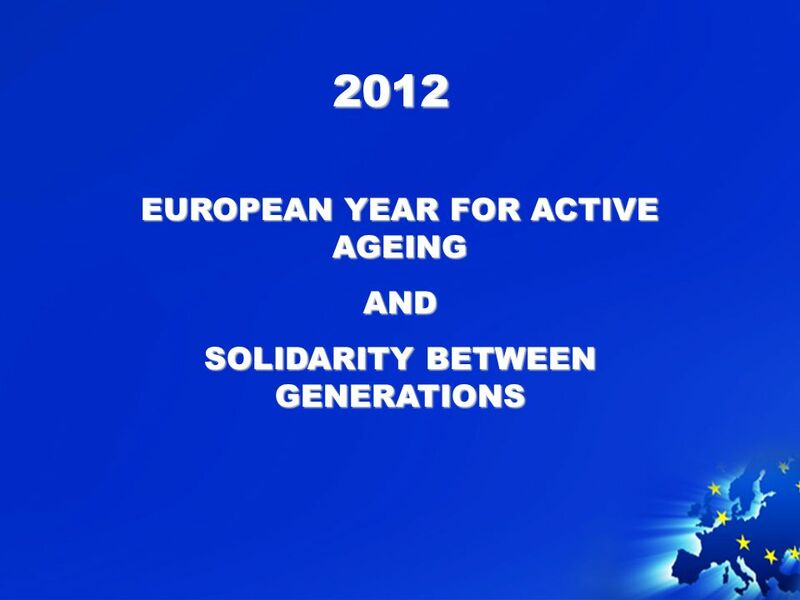 2012 EUROPEAN YEAR FOR ACTIVE AGEING AND SOLIDARITY BETWEEN GENERATIONS. 2 The year is intended to: raise awareness of the contribution that older people make to society; encourage policymakers and relevant stakeholders at all levels to take action with the aim of creating better opportunities for active ageing and strengthening solidarity between generations. 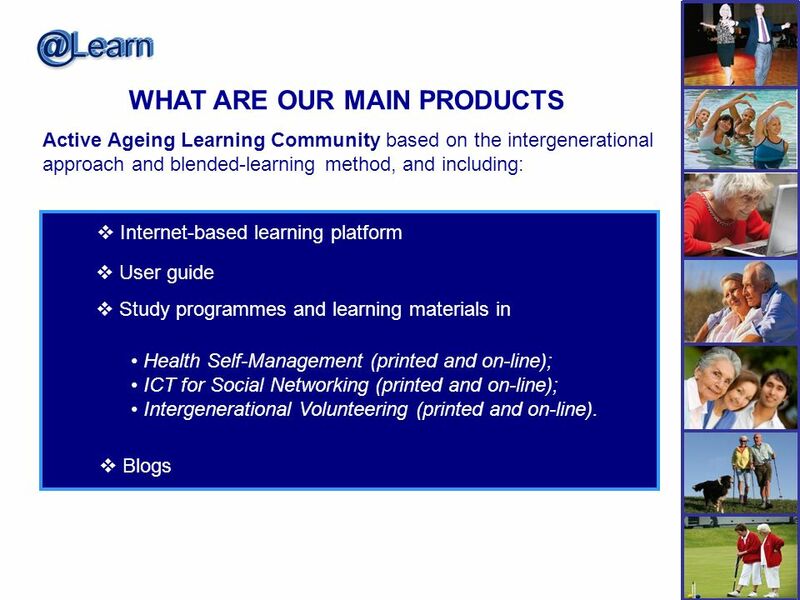 Active ageing as a term was introduced (2002) by the European Comission. This concept evokes the idea of longer activity, with a higher retirement age and working practices adapted to the age of the employee. 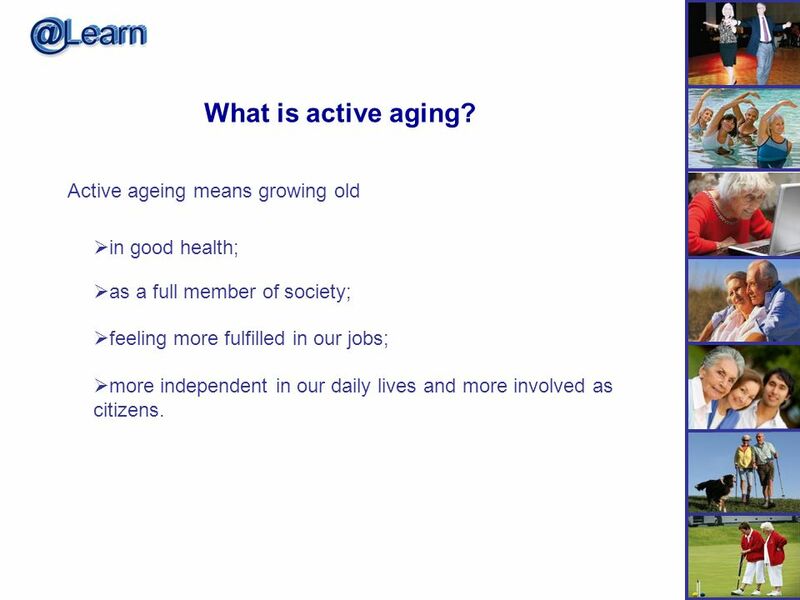 3 What is active aging? Active ageing means growing old in good health; as a full member of society; feeling more fulfilled in our jobs; more independent in our daily lives and more involved as citizens. 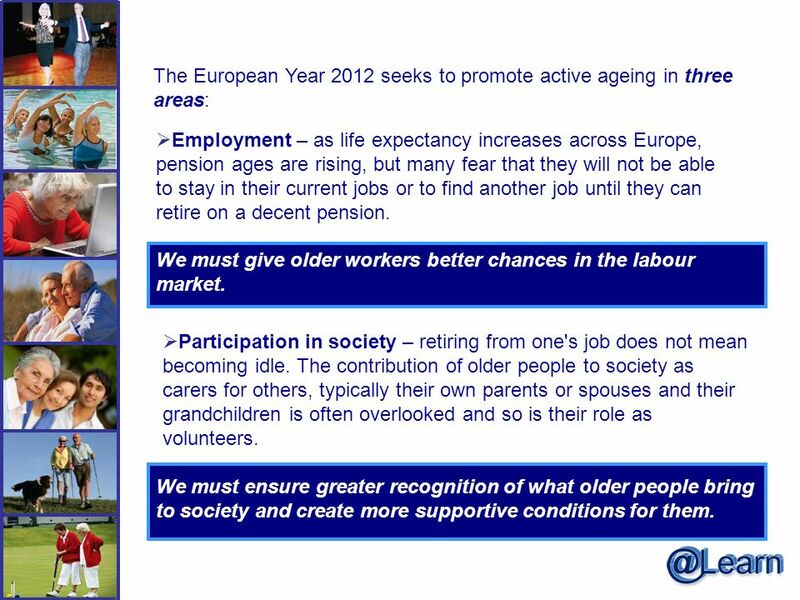 4 The European Year 2012 seeks to promote active ageing in three areas: Employment – as life expectancy increases across Europe, pension ages are rising, but many fear that they will not be able to stay in their current jobs or to find another job until they can retire on a decent pension. Participation in society – retiring from one's job does not mean becoming idle. The contribution of older people to society as carers for others, typically their own parents or spouses and their grandchildren is often overlooked and so is their role as volunteers. We must give older workers better chances in the labour market. We must ensure greater recognition of what older people bring to society and create more supportive conditions for them. 5 Independent living – our health declines as we grow old, but a lot can be done to cope with this decline. And quite small changes in our environment can make a big difference to people suffering from various health impairments and disabilities. The European Year 2012 seeks to promote active ageing in three areas: Active ageing also means empowering us as we age so that we can remain in charge of our own lives as long as possible. 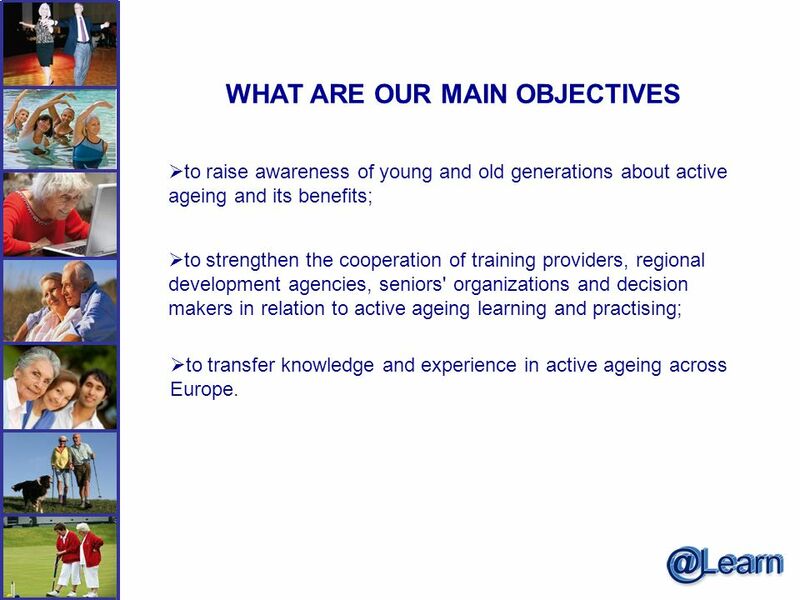 10 WHAT ARE OUR MAIN OBJECTIVES to raise awareness of young and old generations about active ageing and its benefits; to strengthen the cooperation of training providers, regional development agencies, seniors' organizations and decision makers in relation to active ageing learning and practising; to transfer knowledge and experience in active ageing across Europe. 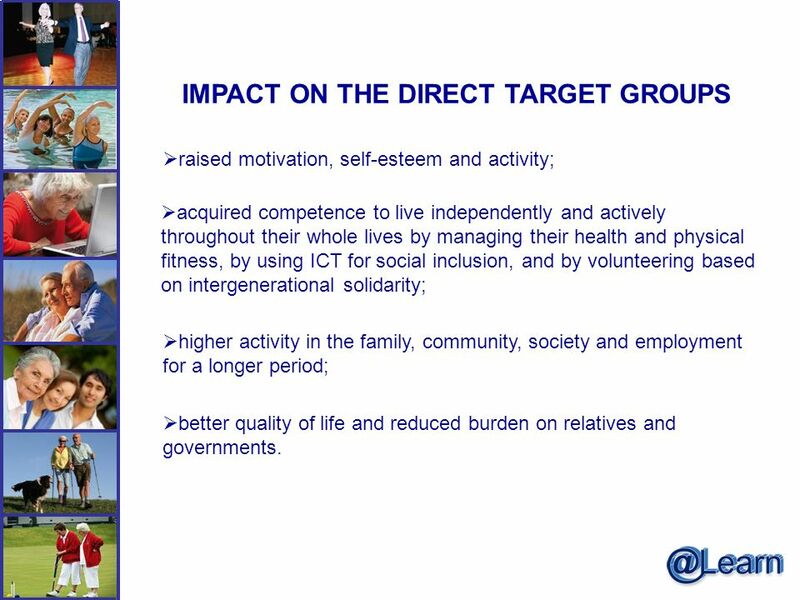 12 IMPACT ON THE DIRECT TARGET GROUPS raised motivation, self-esteem and activity; acquired competence to live independently and actively throughout their whole lives by managing their health and physical fitness, by using ICT for social inclusion, and by volunteering based on intergenerational solidarity; higher activity in the family, community, society and employment for a longer period; better quality of life and reduced burden on relatives and governments. 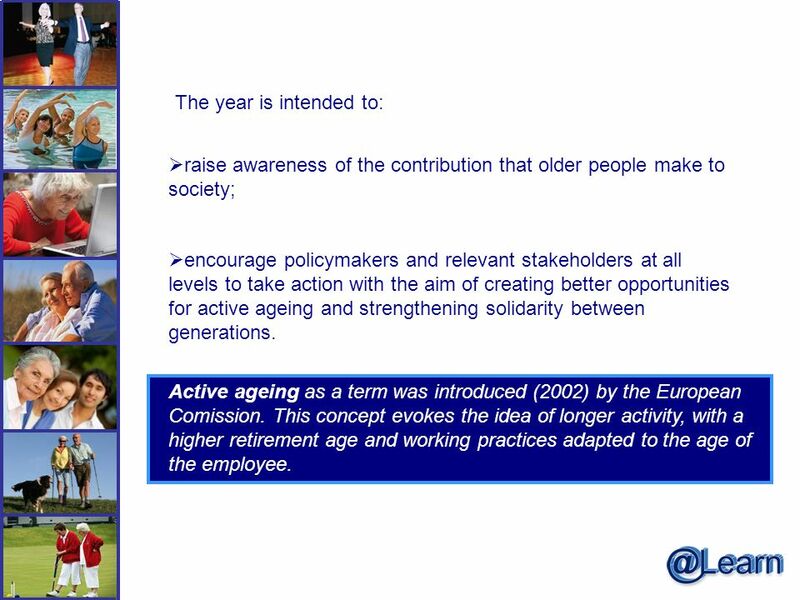 Download ppt "2012 EUROPEAN YEAR FOR ACTIVE AGEING AND SOLIDARITY BETWEEN GENERATIONS." Social Security Department International Labour Office Challenges to labour market policies coming from recent social security reforms Will reformed pension. 1 AGE Platform – Growing old in Europe: challenges and ways forward – setting the scene Dr. E. Mestheneos, Vice-President AGE-Platform 50+Hellas Madrid. GATE Definition of Active Ageing. GATE Define GATE Definition Note: We will consider this in the context of the non deficit model of ageing looking at. 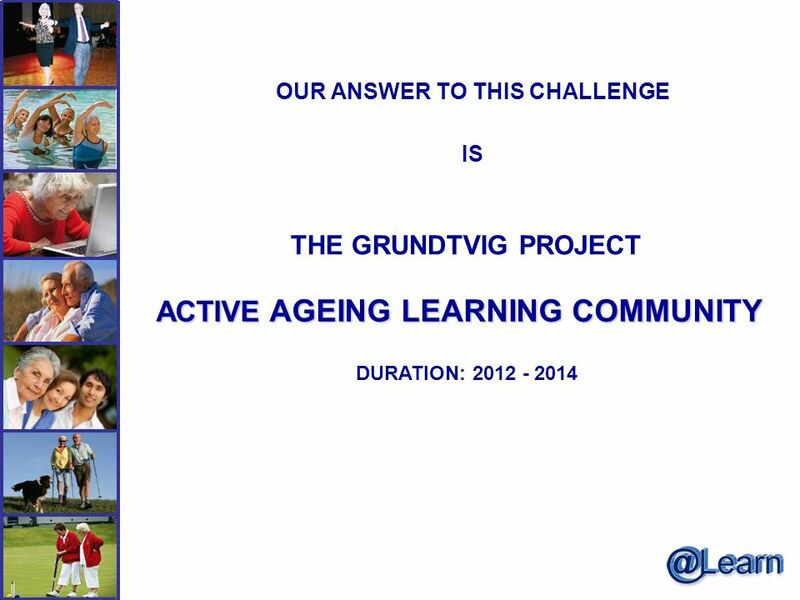 GRUNDTVIG - EUROPEAN COOPERATION IN ADULT EDUCATION. PRESENTATION Youth and Health-an overview from the European Youth Forum Laura Cottey Member of European Youth Forum Working Group on employment and social. Universities of the Third Age: A demographic priority Case study in Poland Catherine Lockhead-Strzępka, M.B.A. Institute of Economics University of Information. Natasa Mauko Slovenian Association of Disabled Students. Summary I. Actions implemented before 2012 II. 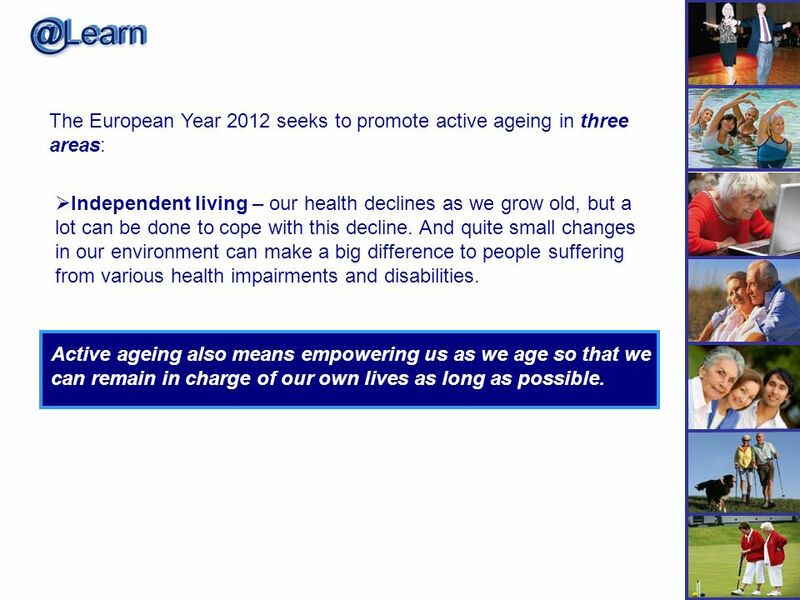 2012, The European year of active ageing III. Prospective project after 2012. 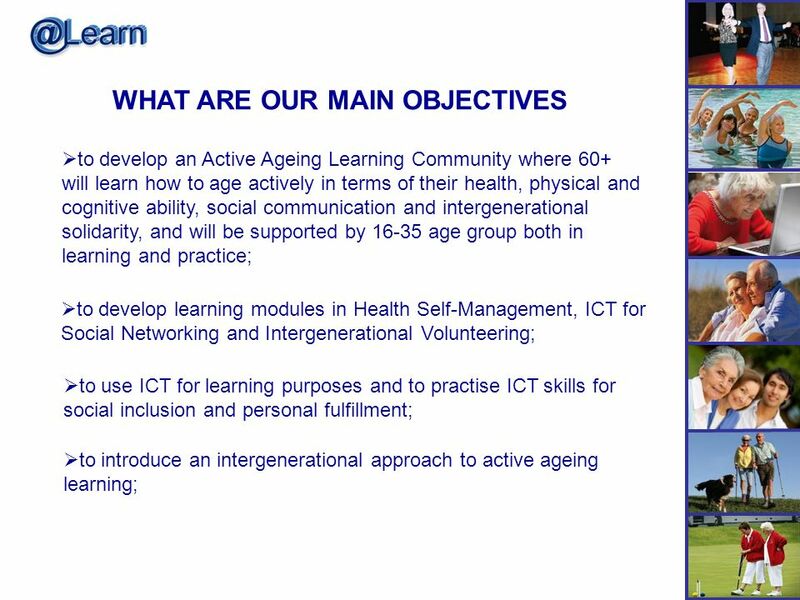 Building a Society for All Ages HMG Strategy for our Ageing Society Michael Murray Project Manager. 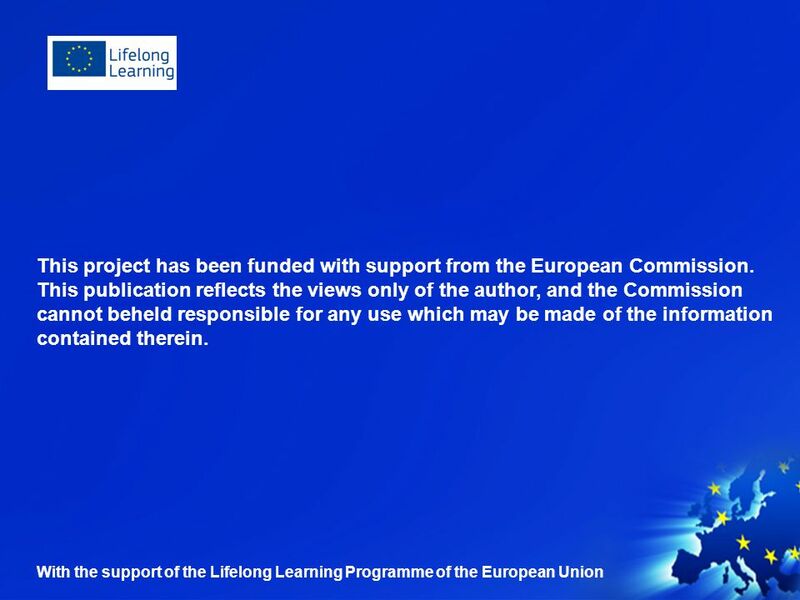 Date: in 12 pts Lifelong learning programme European Policy on Lifelong Learning and Older learners Martina Ní Cheallaigh IFA, Prague, 30 May 2012. Volunteering “Making an impact in Manchester” Alex Fairweather Greater Manchester Youth Network. Towards an Age Friendly Society in Ireland Louise Richardson, AGE Vice-President Ageing, Health and Environment: Partnerships for Excellence, DkIT, 2 May. Kick-off Meeting Granada, 16-17/04/2009 An introduction to LLP, LdV sub- programme and the TOI action. 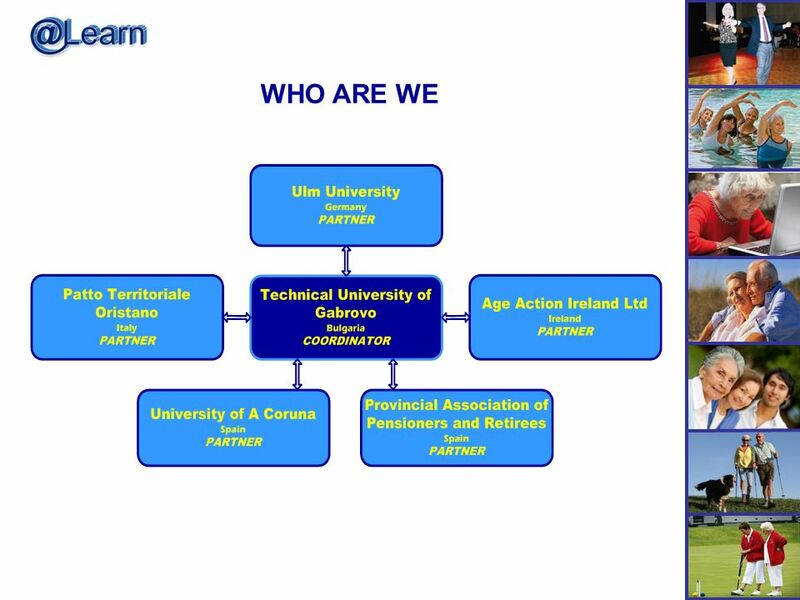 BASIC WEB 2.0 SKILLS BY LEARNING IN FAMILY ENVIRONMENT Romanian Society for Lifelong Learning. 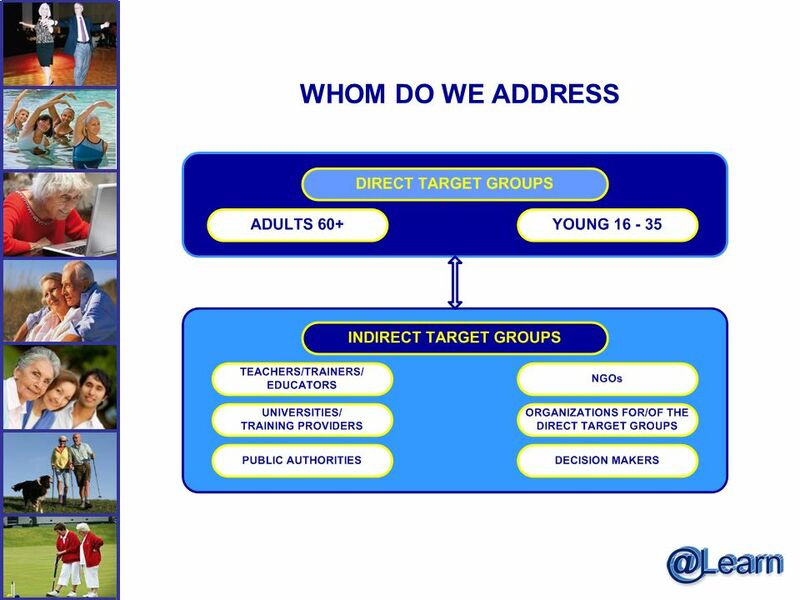 Inter gener ACTION ‘A training course to develop intergenerational actions involving young people’ interactive Methodology: A creative and interactive.